SRT Officer Joseph Weekley demonstrating handling of his weapon. His stance is simllar to that Mertilla Jones testified he used when he entered her doorway and shot Aiyana, 7, to death on entry. His trigger finger, however, is bent as if on the trigger. 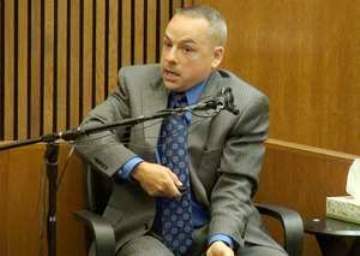 DETROIT – Detroit Special Response Team (SRT) Officer Joseph Weekley, who shot Aiyana Stanley-Jones, 7, to death on May 16, 2010 with an MP5 submachine gun, took the stand June 13 in his own defense against charges of involuntary manslaughter and reckless discharge of a firearm resulting in death. He rolled his eyes to the ceiling, and his tongue under his lower lip as if moistening it, as defense attorney Steve Fishman began questioning him. Weekley, who lives in Grosse Pointe, responded that they were six and eight, and that he was at the park with them when he was recalled to the SRT base for the Jones home assault. Other officers have testified they were recalled between nine and 10 p.m.
Weekley referred to the couch where Aiyana and her grandmother Mertilla Jones were sleeping. Jones testified earlier that Aiyana’s head was resting on the arm of the couch and was not covered by her blanket. She said her own robe, which she used to cover herself for warmth, had come half-way off. “As soon as the bang goes off, I hear a “haaaa” coming from up under underneath what I thought was laundry,” Weekley said, referring to the “bang” of the incendiary grenade that had just been tossed through the window over the couch. Weapons expert Brent Sojea said he tested Weekley’s gun, shown in photo, repeatedly to see if it could fire without pulling the trigger. He said it could not,. Weekley referred to the man he and the second officer into the room, Shawn Stallard, saw standing in a bedroom door on the side of the living room, who was Aiyana’s uncle Vincent Ellis. 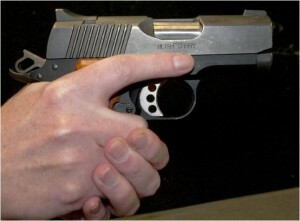 Firearm safety involves keeping finger off trigger, even when someone grabs weapon. Weekley said, “In a controlled situation at a range, you feel the vibration of the gun,” and denied knowing his own gun had fired in the Jones home. “So you’re trained not to put your finger on the trigger until you want to pull the trigger, and yet your finger pulled the trigger on the gun. You pulled the trigger, you fired the gun,” Moran said. Expert depiction of Aiyana’s shooting by Weekley, after second autopsy showed she was shot through the top of the head, not her neck. Slide from family attorney Geoffrey Fieger. 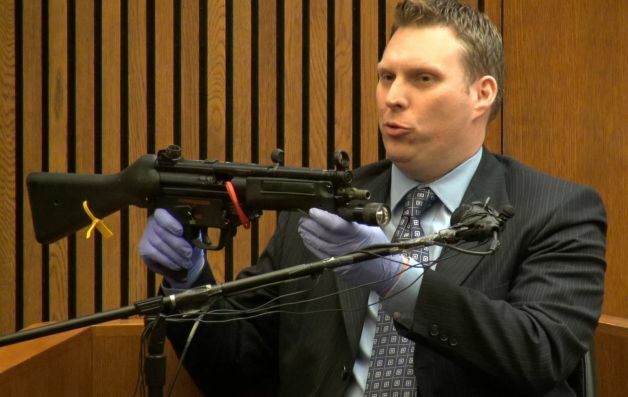 Other officers and a weapons expert testified earlier that an MP5 can’t fire unless the trigger is pulled, and that they are trained in “trigger discipline,” not to put their finger on the trigger unless they intend to shoot, even if someone tries to take the gun away. 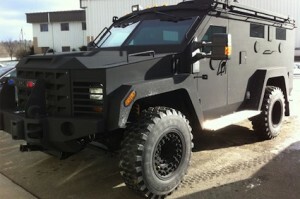 The weapons expert said it takes six to eight pounds of pressure to pull the trigger on the actual gun Weekley used. He said he tested the gun numerous times by dropping it, pounding on it, and other methods, but it did not fire. 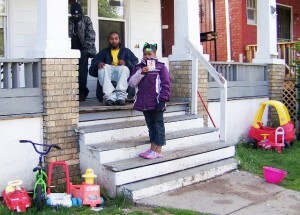 Toys in this photo, showing Charles Jones on front porch and Aiyana’s classmate Diamond, 7, are the same toys seen in the evidence technician’s photos of the house. Defense has contended it was too dark to see them, but there is a bright atreetlight just one door down, which was working according to other photos. Moran continued with Weekley’s cross-exam. “Oh yeah,” Weekley said emphatically. “No I did not,” Weekley said. 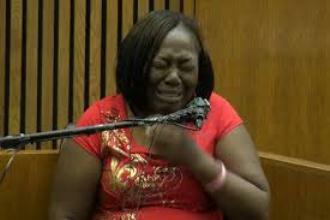 Aiyana’s mother Dominika Stanley on stand at beginning of trial. 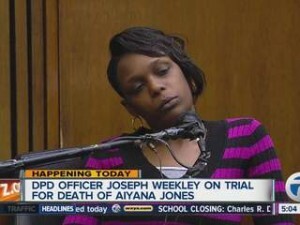 Jones testified during the trial June 10, and during her videotaped statement to the police May 16, 2010, that she did not grab Weekley or his gun. During that interrogation, she assented immediately to DNA and fingerprint tests. “You can have them, baby,” she told the officers who were interrogating her. 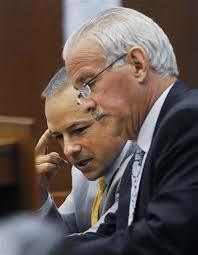 A technician testified that neither fingerprints nor DNA from Mertilla Jones were found on the gun used to kill Aiyana. 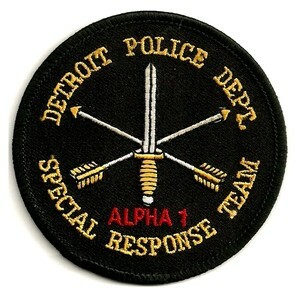 Other members of the Special Response Team which raided the Jones home that day have given testimony which conflicts with Weekley’s as well as each other’s. SRT Officer Shawn Stallard was second into the house. He testified June 11 that Weekley paused for a few seconds on the threshold of the house, and that he [Stallard] heard a gunshot “a few seconds” afterwards. He said he did not see anyone else in the doorway, and that no one else was in the immediate vicinity, either standing or on the ground. 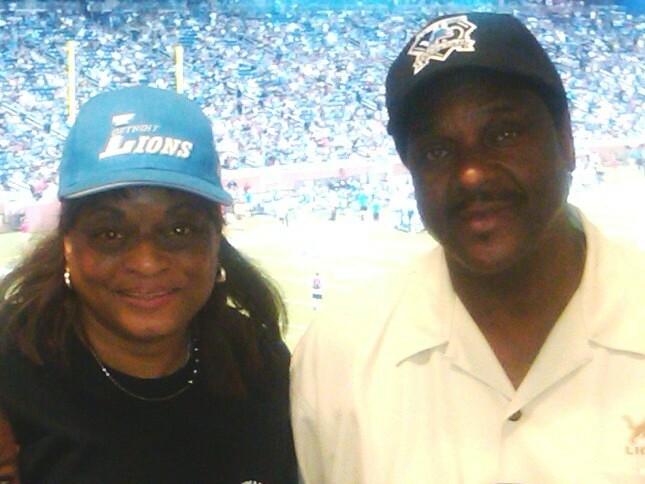 He said he saw no one struggling with Weekley. Stallard said that when he heard the gunshot, he thought someone was shooting at the officers. Testimony has shown that the only bullet and shell casing found in the room was from Weekley’s gun, and that no civilian weapons were found in the house. Stallard said he looked to the left to see where the gunshot came from. He said he saw Aiyana’s cousin Vincent Ellis standing in the bedroom doorway opening off the side of the living room a few feet from the couch. Stallard said Ellis retreated when he heard the grenade go off, but that he and Weekley continued towards Ellis. He said found no gun in Ellis’ room, and that Ellis was dressed in a T-shirt and shorts, with no place to hide one. He said he handcuffed him and left him there while he went to search the other rooms to find the origin of the shot. Stallard said he never saw anyone try to take Weekley’s gun away, and that he never saw handcuffs on any civilian in the living room. He said Weekley asked him around seven or eight a.m. that morning what he saw, and that he told him what he had just testified to. 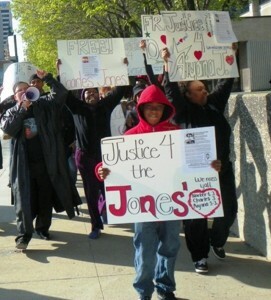 Rafael Jones, 14, leads march for Justice for Aiyana and Charles Jones April 23 2012 at Frank Murphy Hall in downtown Detroit, grandmother Mertilla Jones at left, aunt LaKrystal Sanders at right. Sanders lived upstairs from the Jones family. Sgt. John Collins, who had been on the SRT 18 years and with the DPD 26 years, said he was assigned to cover the left side door to the house, which led upstairs to the flat where Sanders and Chauncey Owens lived. He said he heard a gunshot fired directly after the “diversionary device” was tossed through the window in the lower flat. He said he and another officer broke the second door down, but then his attention was diverted. Collins said Weekley told him he had accidentally shot the little girl before grabbing at Collins’ gun. He said he tried to calm Weekley down. Collins said that was standard operating procedure in an officer-involved shooting. He said tried to calm Weekley down. SRT Sgt. John “Bulldog” Widmer, who was the commanding officer at the scene, however, testified he told Weekley that everything WOULD be OK. He testified that the training SRT officers receive, referred to in other testimony as “640 hours,” is actually called “Policing Terrorist Suspects.” Widmer and Weekley are seen training officers in the “Detroit SWAT” video below, from the A & E website. Widmer began choking and coughing at that point on the stand. He said after talking to DPD Lieutenant Don Johnson, who is in charge of several divisions including Homeland Security and SRT, he went back to Weekley. 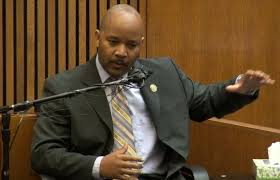 Inspector Johnson also testified, indicating he had given specific orders to the team not to have the A & E camera crew present during the raid, and that even the homicide unit, which did not report to him, should have followed his orders as a superior officer. Neither side asked Widmer why those alleged orders were disobeyed. “There is an allegation that Weekley came up to the little girl, put a gun to her head, and shot her,” Fishman said on cross-exam, referring to Mertilla Jones testimony. “You’ve got to be joking,” Johnson said. 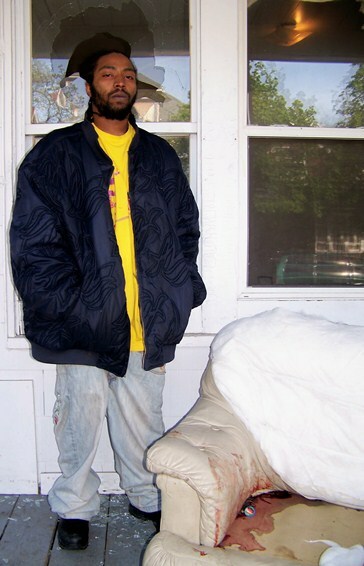 Charles Jones stands next to the couch on which his little daughter died earlier that morning. Blood is seen under the cushion as splatter expert testified. On June 12, A blood spatter expert testified that she found blood saturating a couch cushion on the south side of the couch where Aiyana’s head was, and underneath the cushion as well. She said there were also some “small blood spatter stains” on the exterior of a nearby door, which appeared to be from blood dispersed through the air. Judge, attorneys, jury and the media also attended a demonstration of the use of a stun grenade that afternoon. After closing statements Thursday, Judge Hathaway turned the case over to the jury. She told them the photographs from Mark Robinson’s Facebook page allegedly showing him, his brother Markewell, and uncle Vincent Ellis with guns could be used to discredit the witness’ testimony if they thought they were relevant. Robinson was never recalled to the stand by Fishman, as the attorney had threatened. Robinson did not testify during direct or cross about the presence of guns in the house, or the possession of guns by anyone in the photographs, and was not cross-examined about the photographs. Hathaway told the jury to deliberate Friday, June 14, although she had instructed them at the beginning of the trial that they would not be meeting on Fridays. When they did not reach a verdict that day, she directed them to return June 17 and deliberate until 3:30 p.m. Anyone that has gone through the Marines, police academy or other training to become a killer is trained to keep finger off trigger until such time to engage target…period. This jagoff cop violated very basic gun handling practices (when looking for “work”) and his negligence caused the death of a precious child. He is guilty of voluntary manslaughter.